Crystal Kalas of the Child Development Centre with city councillors on Feb. 11, 2019. • Council tabled a decision to approve updates to Conference Hosting Council Policy No. 82/19, Discretionary Grant Council Policy No. 87/19, and Base Budget Grant Council Policy No. 105/19, which outline how the city awards grants in support of non-profit operations and events. The amendments would co-ordinate grant requests to the city and regional district to avoid duplicating funding for the same event or program. City taxpayers already pay into the PRRD's grant program through municipal levies, an administrative report notes. Council tabled its decision pending clarifications that are clerical in nature. • Council approved Privacy Management Council Policy No. 140/19, which sets rules for collecting, using, storing, and disclosing information about city employees, elected officials, and volunteers. • Council approved weighted voting assignments for Mayor Lori Ackerman and Coun. Tony Zabinsky, who represent the city on the board of the Peace River Regional District. Weighted votes are used at the PRRD table mainly for money matters — adopting financial bylaws, borrowing, etc. — and each board director is assigned a number of votes proportional to the size of population they represent. Fort St. John gets seven weighted votes: Ackerman has been assigned four; Zabinsky has been assigned three. • Council wants resolutions drafted for the North Central Local Government Association AGM in May, including one opposing a proposed climate action lawsuit against oil and gas companies, and another calling for improved public consultation standards from the province, particularly with caribou recovery planning. Resolutions endorsed by the NCLGA are forwarded to the Union of BC Municipalities for consideration. If approved by the UBCM, the resolutions become provincial lobbying priorities for that organization. • February was proclaimed CDC Month in support of the Child Development Centre. 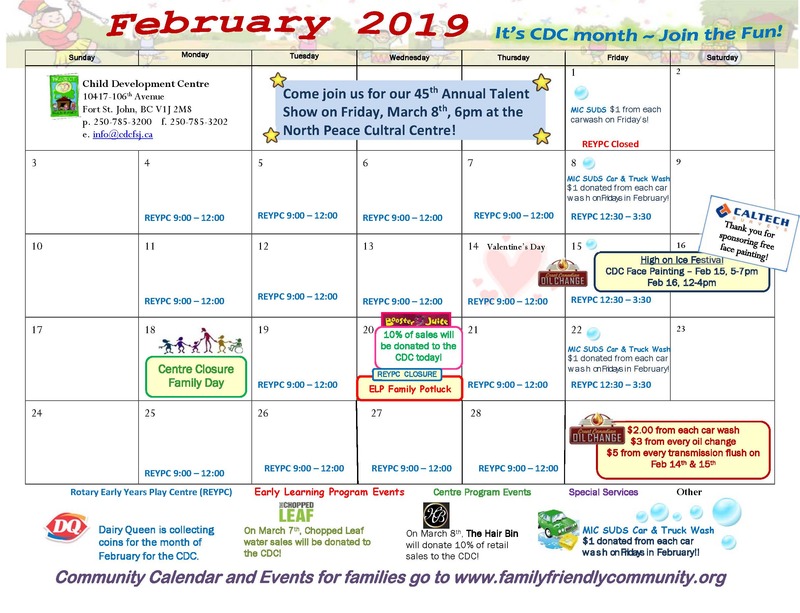 The CDC will host its annual talent show on Friday, March 8, at the cultural centre, and is partnering with a number of businesses on a number of fundraising initiatives in advance of the show. The CDC aims to raise $100,000 to buy sound panels for its gym, upgrade its intercom and phone systems, install a therapy swing, and reduce its mortgage debt. To learn more, click here. • February was proclaimed Women's Institute Month, celebrated annually across Canada in honour of WI founder Adelaide Hunter Hoodless. There are three Women's Institutes in the North Peace: Baldonnel, North Pine, and Nor’ Pioneer in Cecil Lake, which meet monthly in the spirit of education, and fundraise to support of various local groups including 4-H, the women's resource centre, and various schools. • February 18 to 22 was proclaimed Thinking and Founder Week in support of Girls Guides of Canada and Scouts Canada.